Our Story » GetRecD Events - Get Recreational while DIRECTLY supporting cancer patients. 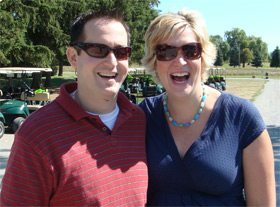 In 2003, brother and sister, Ryan and Laura Daly, decided to organize a recreational golf tournament that would bring friends and family together and raise money for local charities such as, Make a Wish Foundation and The Cancer Society. In 2006, Ryan’s good friend, Darrin, was diagnosed with Leukemia at the age of 27. Ironcially, 8 months later, Ryan Daly was diagnosed with Leukemia at the age of 27. How do two good friends get the same disease. Sadly, after a courageous two year battle, Ryan passed away at the age of 29. His spirit, legacy, energy and love will always remain. GetRecD events is hosted in memory of Ryan Daly and we look forward to the day when a cure for cancer is found. We are happy to state that Darrin continues to do very well. We received a fantastic email from a patient at Princess Margaret, that stated “The use of the GetRecD laptop has been useful and allows her a bit of brightness everyday, just to know that she can stay in touch with others”. We hope to continue to donate items and funds to cancer patients and cancer facilities. Please assist us in our mission and join us at an event or donate by contacting Laura Daly at laura@getrecd.org. We are constantly in need of items for the cancer baskets, so any items you may have to donate will be greatly appreciated.